Goats and sheep are a common sight in Sardegna. 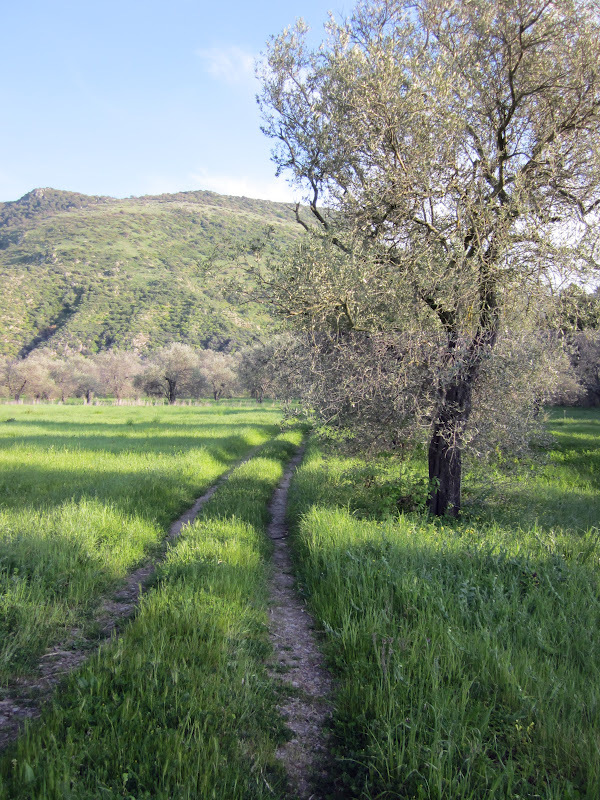 Here in Masainas, with the Carboni family, I was able to experience farm life from an insider's perspective! 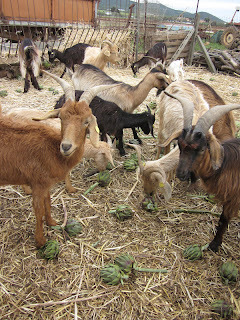 Every morning and evening the goats (and donkey) get fed hay and last years dried artichoke remains. All of the mama goats are milked twice a day and their milk is either sold, made into cheese or consumed by the family (and lucky me!). Goat milk is thick, creamy and delicious (and actually very low in fat- not sure how?). Sometimes, when they have over harvested artichokes, the goats get a special treat! 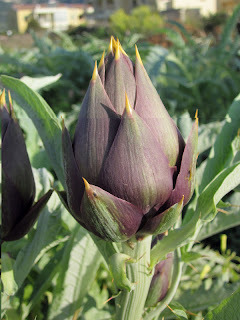 Coming from the US, where artichokes are a rare delicacy, you can imagine my surprise when I was told to hurl as many artichokes into the goat pen as I could possibly manage! It was fun to watch their individual methods of attacking these spiky treats! As with all things on a farm, nothing is wasted. All of the goats are used to produce a product of some kind- either milk, meat (baby goats are especially popular to sell at Easter time), or parts. Here is a photo of the rotisserie goat we had for lunch one day. 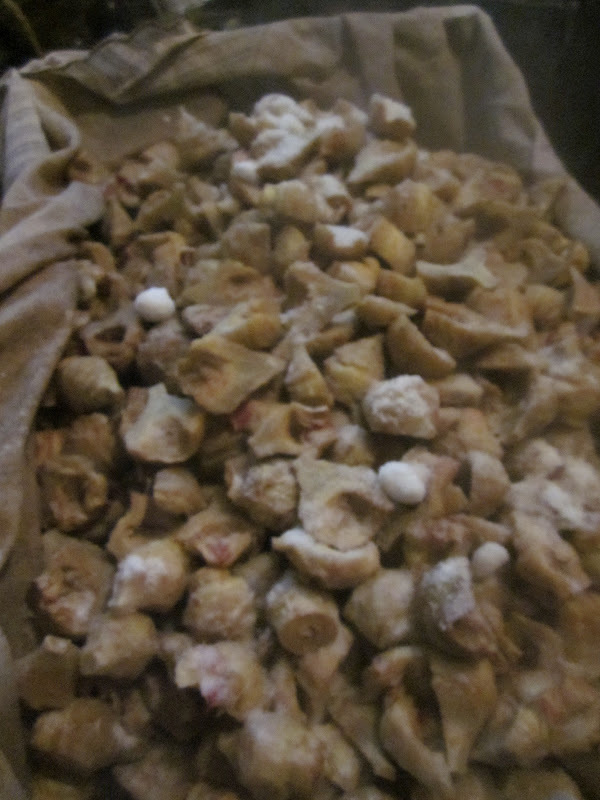 It is goat stomach and large intestine intricately woven by hand with the small intestine. It was surprisingly tasty! Baby artichokes preserved under oil is a delicacy from Sardegna! 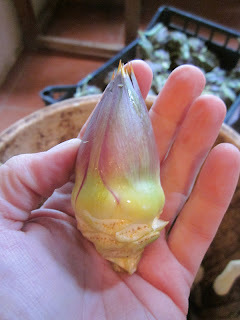 This is the basket used to collect artichokes. 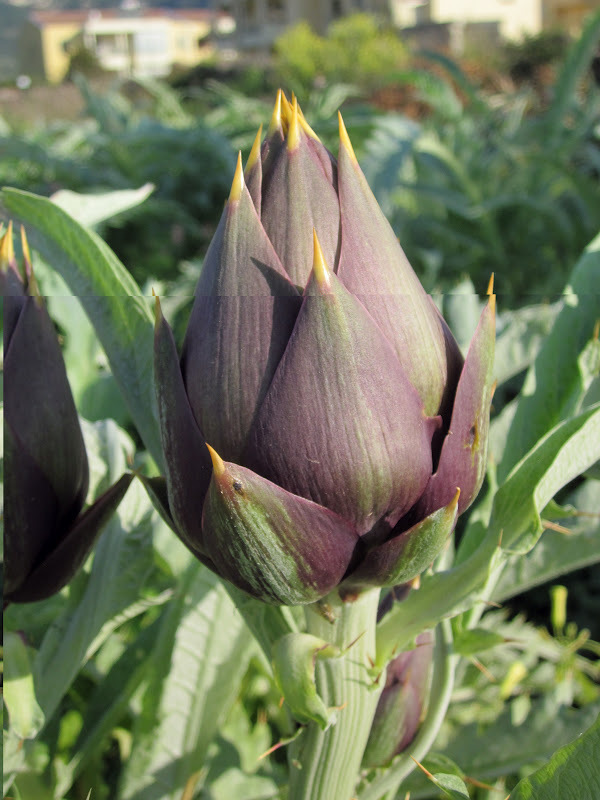 You wear it like a backpack and walk through the field, cutting artichokes and tossing them into the pack. It has a plastic board next to your back so you don't get poked by the spiky artichokes. 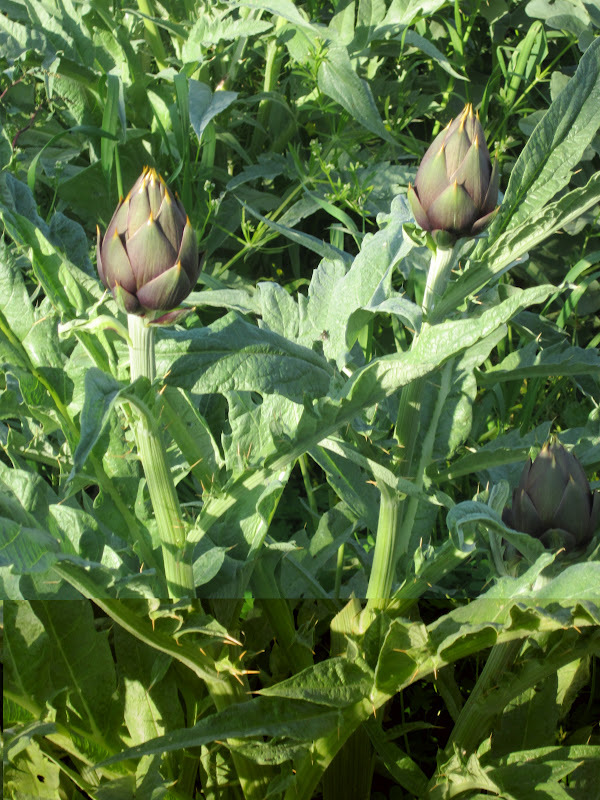 Artichokes are better when harvested when they are smaller. They offer less flesh but what they do give is more tender and flavorful. 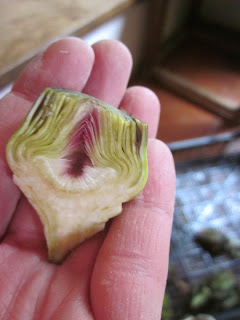 The stem is also delicious! 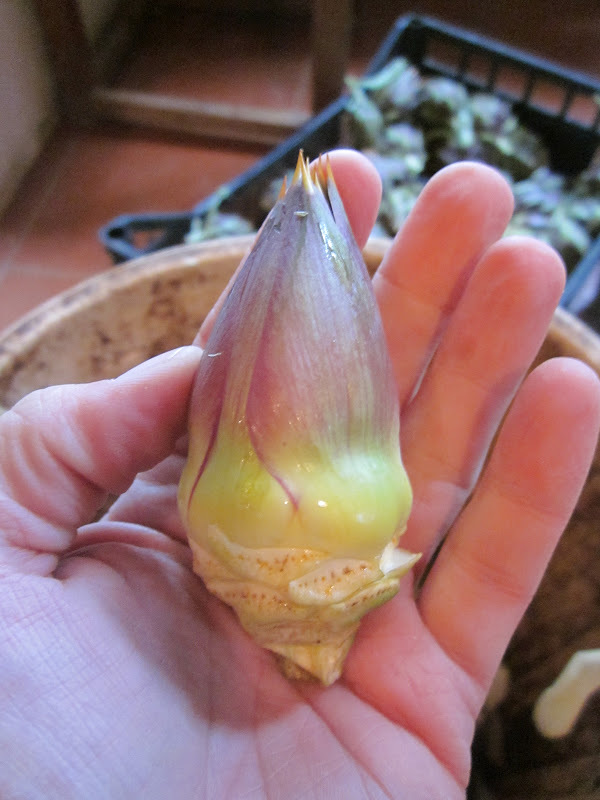 The Sardinian artichoke, with spines and all! Baby artichokes must be cleaned of all their leaves, down to the heart. They are then halved and soaked in lemon water to preserve their color (well actually to avoid them turning black due to oxidation). This is a labor intensive process! It takes me approximately 2 minutes to clean each artichoke. I spent 3 hours cleaning one of those baskets on the floor in front of me. Eight of those baskets made 43 jars that sell for approximately 6.50 euro each ($9 USD). Peeling back the outer layers reveals a beautiful array of colors... I love the purples and greens! The heart, before the furry center is removed! Step 5: When you reach the top, add a few more garlic slices, rosemary, mint leaves and a teaspoon of black pepper corns. Step 6: Fill to the top with Extra Virgin Olive Oil, making sure all items are covered and under the oil. Step 8: Remove from boiling water, tighten lid again and wipe. Listen for suction sound and look for small bubbles to all come to the top. Store for 6 months and enjoy through the summer! 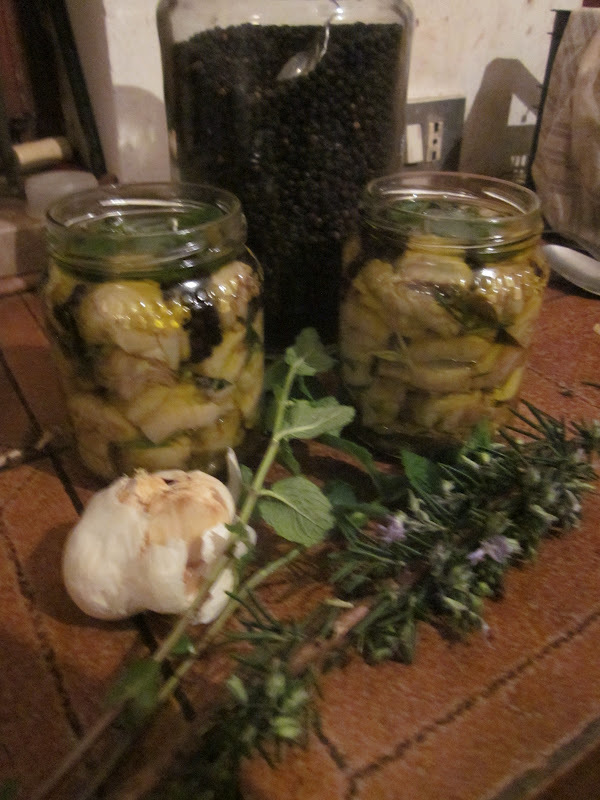 These 6 jars are the result of 3 hours of peeling 1 basket of artichokes! Lots of love in these jars! A spice, by weight, worth more than gold. Each autumn the dormant saffron crocus bulb comes alive to produce a beautiful purple flower. At this time of the year it looks like nothing but dead weeds. The bulb will flower 3 times before it dies. Each bulb costs approximately 10 euro. Within the flower there are 3 stigmas attached and they must be carefully picked by hand. 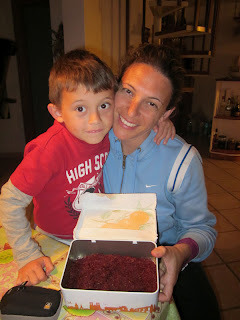 For my new friend, Franca, it will take her 2 weeks to do this alone. 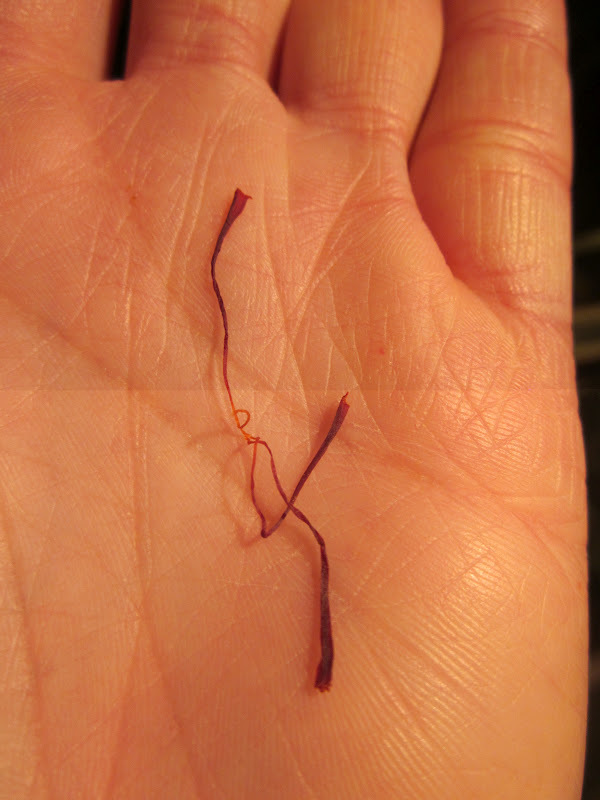 This is 80-100 grams of saffron, the remainder of Franca's harvest from last autumn. 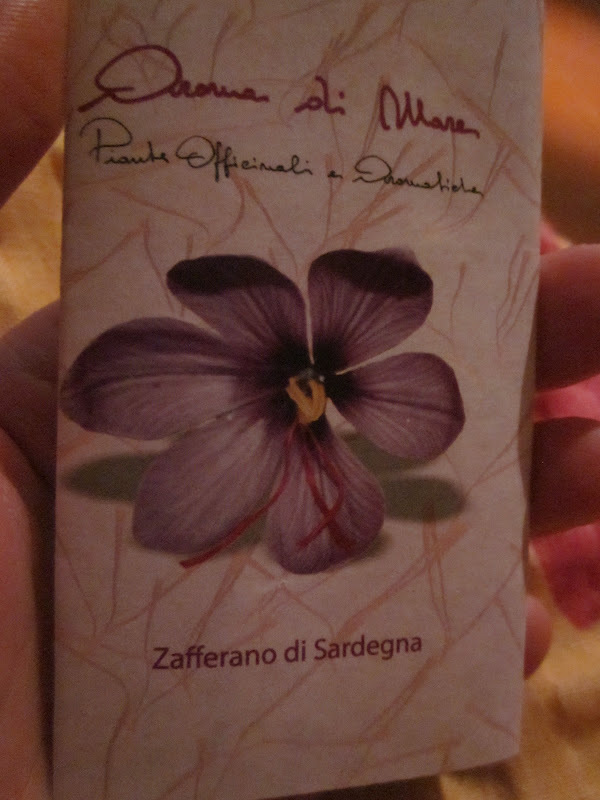 Once the saffron is picked, she will dry it and then package it to sell in 0.1g quantities (see below). 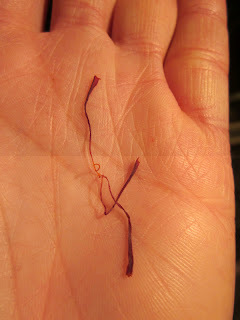 Saffron sells for approximately 18 euro per gram. Fresh saffron is enjoyed best when toasted and then crushed into powder. I was lucky enough to get a small package of this saffron so when I use it I will heat it quickly in a dry pan and then let it cool. Once it is cooled, I will put it in an envelope of parchment paper and crush it with the top edge of a knife until it is made into powder. Saffron is classically used in Risotto Milanese but is also used in many other dishes here in Italy! 1. In a 12 to 14-inch skillet, heat the olive oil over medium heat. browned, 8 to 10 minutes. 2. Meanwhile add the saffron to the stock, stirring to infuse. wooden spoon until toasted and opaque, 3 to 4 minutes. 4. Add the wine to the toasted rice and let reduce until nearly dry. stirring, until it is absorbed. liquid is absorbed before adding more. Stir, stir, stir! 8. Stir in the butter and cheese until well mixed. 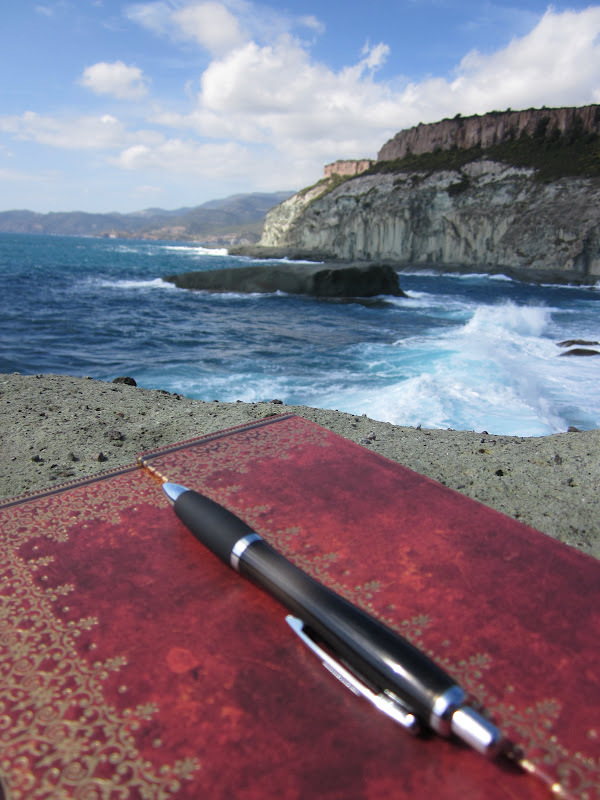 I loved my time in Bosa and will never forget the wonderful people I met and adventures I had. 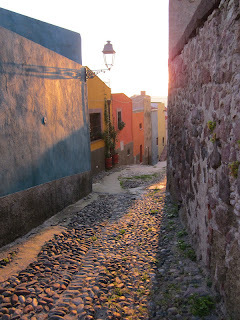 Here are some of my favorite photos that capture the memories of my time there. Ricco (ricci is plural). A sea urchin. End of March/early April is the time for harvesting these guys. The roe is eaten over pasta, on pizza or any way you want. 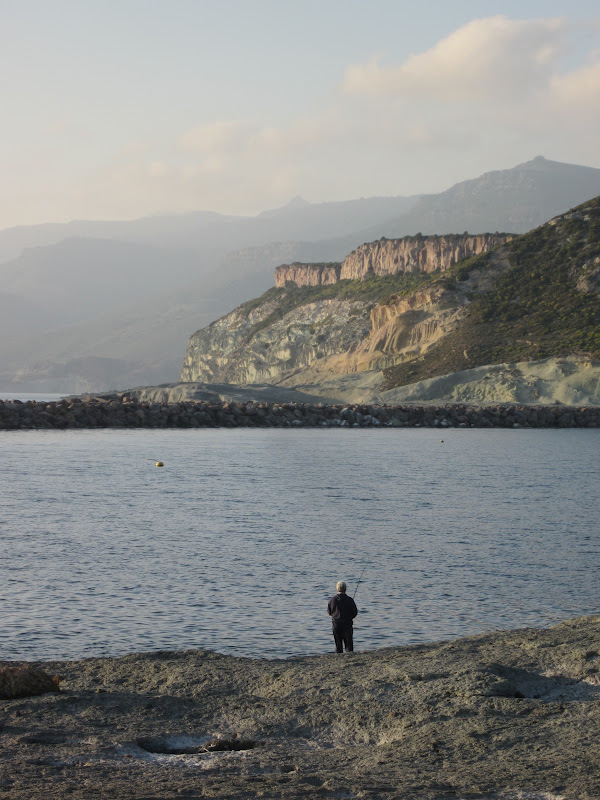 A man fishing at the Bosa Marina. Beautiful rocks jutting out from the ocean. Looking at Bosa from the river valley. An entire aisle of PASTA!!! Bar Canottieri. I frequented this lovely local establishment often daily. This evening I was the only female, and the only one under 60 watching a football match. These were often my odds in bars. Malvasia di Bosa. A special white wine made here. A sweet young wine that is aged in Chestnut barrels. 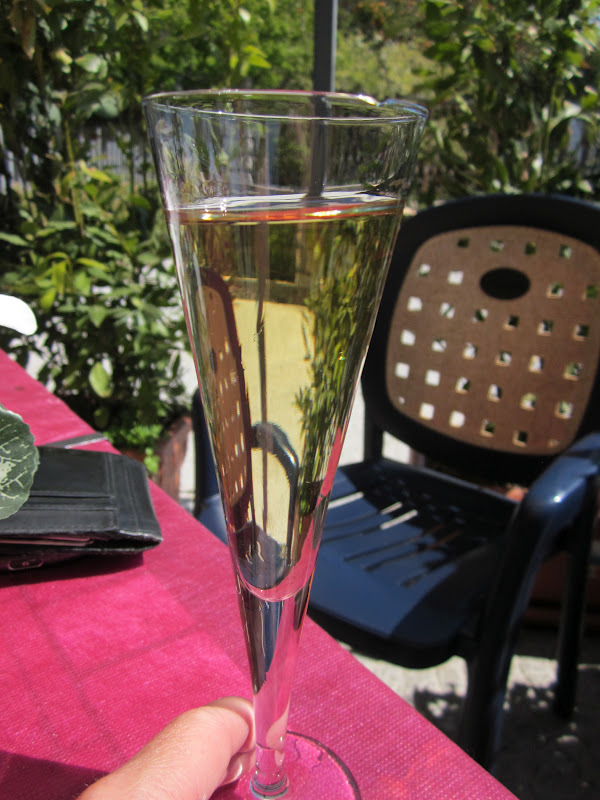 It can be sparkling or flat and is oh so delicious!! My friend for a day, Luca. Together we found the hot disco spot in Bosa and danced all night long to cheesy Bat-Mitzvah music, followed by rockin' 80's and then techno. We had a blast! Great little art studio that Luca and I found on Easter Sunday evening. People were playing the piano and just enjoying the energy. Beautiful Bosa tower and the mouth of the river Temo. I found a lovely walk along the coral rocks. It feels like you are walking on the moon. This was my absolute favorite spot. I sat here for hours and could spend every day here if I had the chance. Seriously could not get enough! 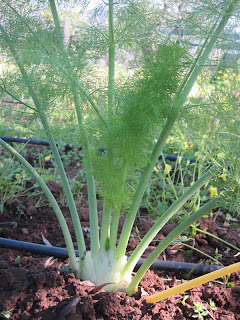 I will forever have a new found love for wild (and cultivated) fennel. 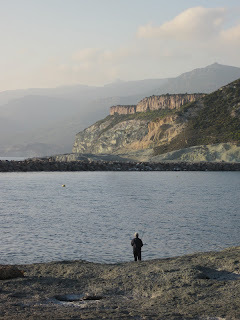 The scents of Bosa that I will remember are those of fennel, wild garlic, artichokes and the sea. 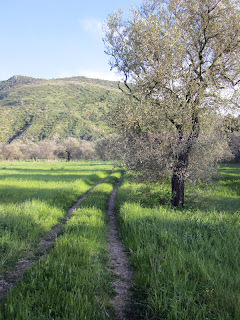 The Zipp family's olive grove behind their home. Bosa corso along the river, lined with palm trees and boats. The Zipp family (Silvia, Michael, Orlando and Nahima). Wonderful hosts, exceptional cooks and full of many interesting life stories! Sunset on the street below my apartment in the historic Bosa center. 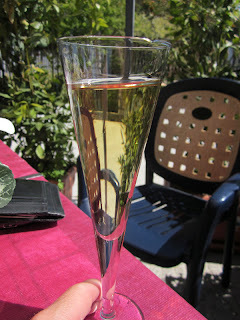 My favorite evening activity in Bosa was watching the sun set on the terrace. First of all, do you know the name of those cute little 3-wheel Italian "trucks" with a short bed in the back and room for one person? They are called Ape, Italian for "bees" because of the buzzing noise they make when driving. 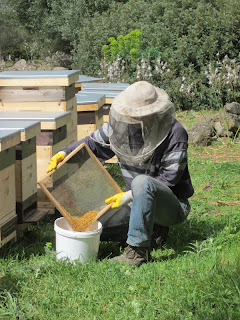 In Sardegna, there are many ape buzzing around and they are making the most delicious honey and bee pollen, especially because of the pure environment and special flowers found only here. April is prime pollen collecting time as many of the flowers are blooming. 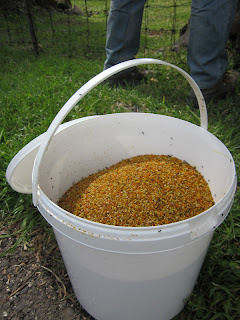 Going with Michael Zipp (my host in Bosa) to collect bee pollen was my first "bee keeping" experience. Bee pollen is supposed to have many health benefits including aiding in allergy relief, increasing your immune system, and they are a complete source of nutrition (containing lipids, proteins, carbs, vitamins and minerals). These are bee boxes. 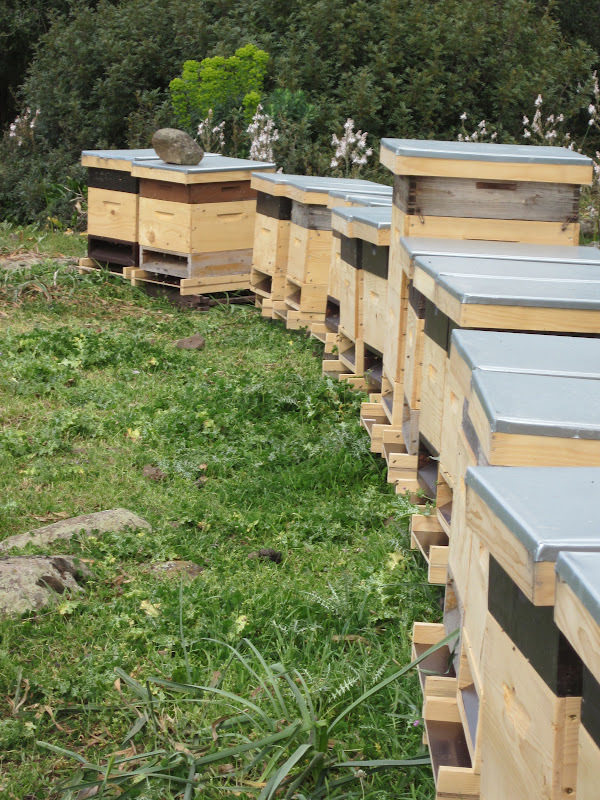 Each box contains 40,000- 60,000 bees. These boxes are filled with Italian bees, which are rumored to be the most productive of the 3 races of bees. A bee takes approximately 30 days to develop and hatch and another 30 days to be able to make honey. The queen bee will lay 2,000 eggs per day. A bee will return only to its own box for its entire life. Michael is opening the trap door in the back and sliding out the screen. He empties the screens once every 2-3 days and will collect approximately 8-10 kg (17-22 lbs) of pollen each time. Pollen on the screen. The different colors of each of the granules of pollen represent a different flower. Each screen will have a different color combination, depending on which flowers the bees from that box had visited in those days. There are multiple locations to collect pollen. Michael will keep each location collection separated. This particular location is in a field with sheep overlooking the coastline and is surrounded by many flowers and trees. 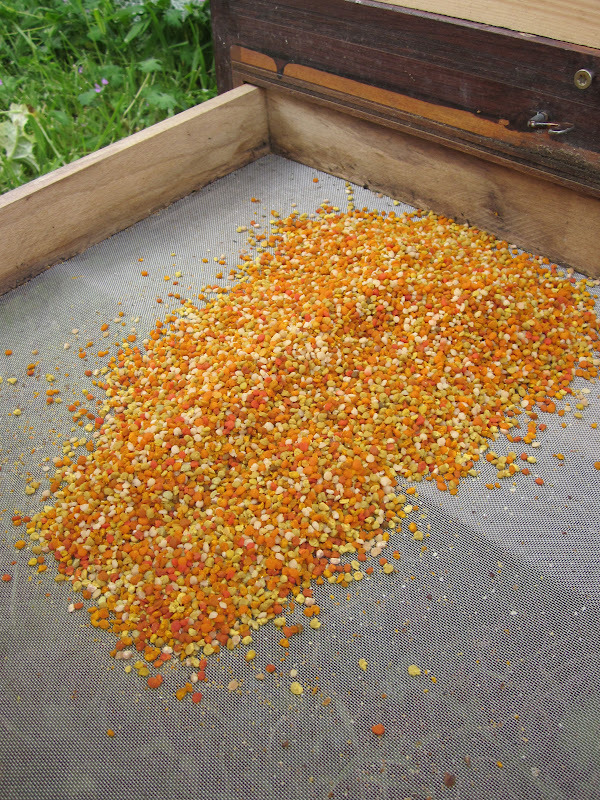 The pollen collection after dumping in a few trays. Can you see the color difference of a few trays- the one on the left has more yellow/brown and the one on the right has more orange. 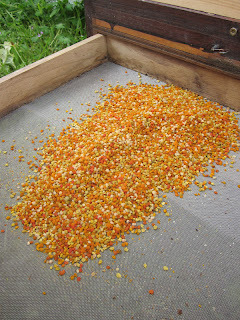 Bee pollen granules. They are slightly soft but still cohesive. There is also a 6 hour drying process that they will go through immediately upon arrival back at home. This drying process will allow them to be preserved and enjoyed for a longer period of time. The final collection from this site. Approximately 8 kilos. Pollen has a distinct flavor. It is slightly sweet and funny enough, floral, but it also has a slightly grainy or mealy flavor as well. 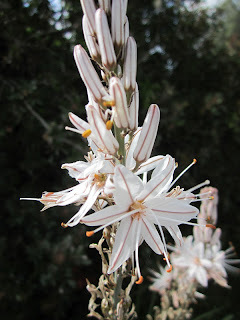 The Asfodello flower, native to Sardegna. The terra cotta color pollen granules are collected from this flower. 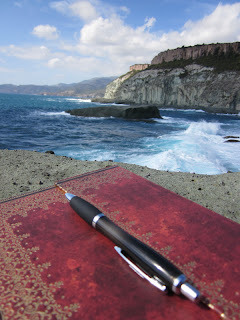 Sardinian pollen can collect a hefty price as well. Wholesale pollen prices are approximately 45 euro/kg. 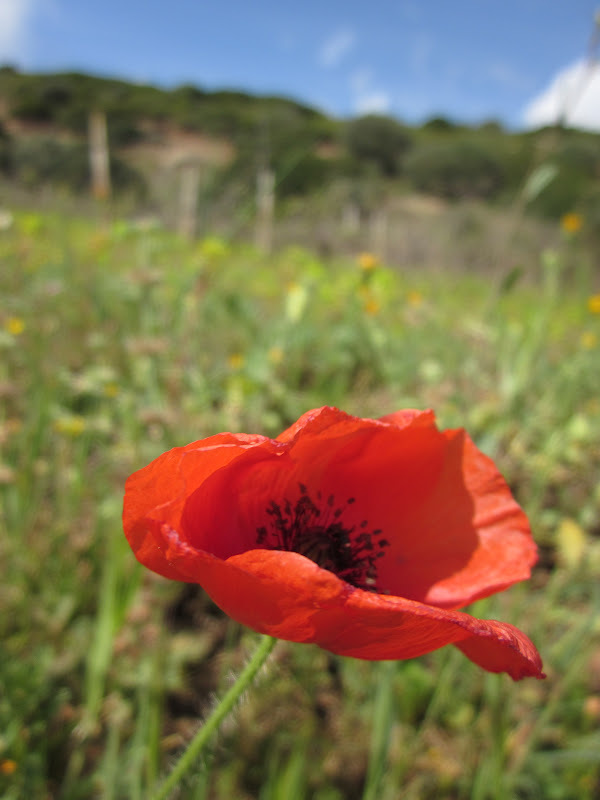 The beautiful poppy. The black pollen granules come from the poppy flower.